The Sublime Text Console you can reach by View->Show Console or with shortcut CTRL+`. On my Mac with german keyboard layout this shortcut combination. You can try CTRL+ö oder CTRL+Ö, but for me it doesn’t work. If you have this kind of problem you can use the menu. After you run the python code in the console you get the success message „Please restart Sublime Text to finish installation„. 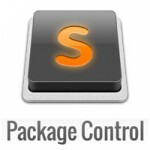 Now Sublime Text Package Control should be installed and ready to use. There’re different python code snippets for Sublime Text 2 and version 3. You can also manually install Sublime Text Package Control if you don’t wand to run python code on your machine for security reasons. After all is done you can control Sublime Text Package Control with the Command Palette which you can run by SHIFT+CMD+P (Mac) or SHIFT+STRG+P (Windows). A complete overview of the functions you can see here.